I wanted this so bad, I could taste it. Two days after my first marathon in 2010 I went into our local running shoe store and I confidently told the employees working there that I was going to get a sub 3 marathon. As you know, there have been many failures, lessons, injuries and growing since then so the sub 3 definitely took more time to get than I was planning on. But all of those things have made it so much sweeter. The goals that take the time, sweat, blood and tears make the victory feel just so unreal. I wouldn’t change the process it took to get this. I wouldn’t change the ups and downs along the way. It happened just the way it should have and I learned how freaking awesome it feels to get the dream I refused to give up on. Let’s talk about the day before the race. I woke up and ran 2.1 miles @ 9:15 pace on the treadmill, we got ready really quickly and then drove to St. George. I had toast with pb, a banana and eggs for breakfast, lots of pretzels on the way down and a sub with only white bread and turkey for lunch. We got back to the hotel from the expo at about 3 and I literally sat down the entire rest of the day. 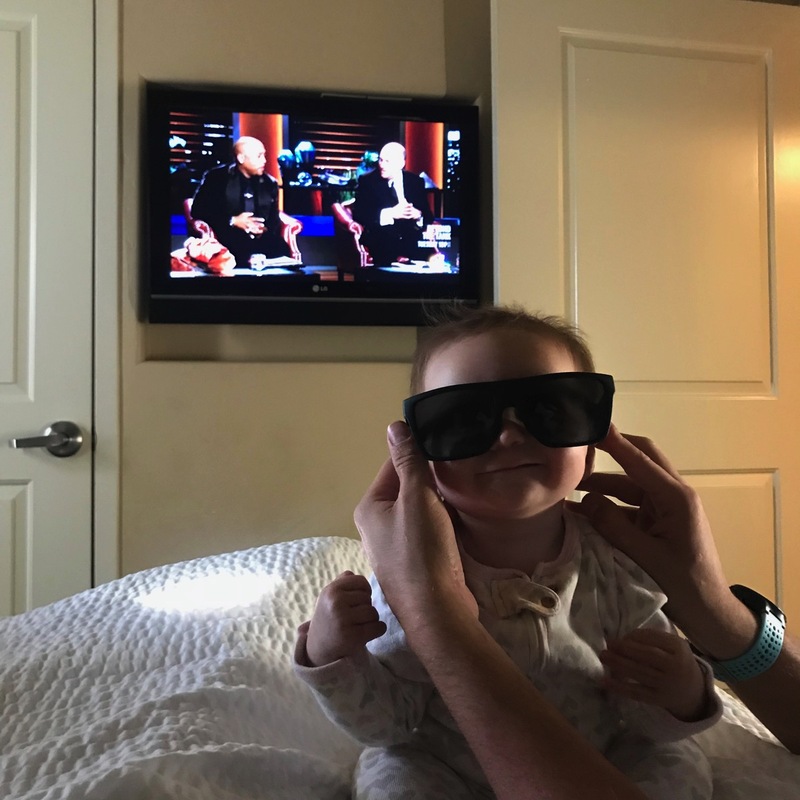 I had a Shark Tank marathon and Andrew had the kids and I relaxed. Andrew picked up dinner from Brick Oven so I could eat at the hotel and not deal with crazy restaurants etc. 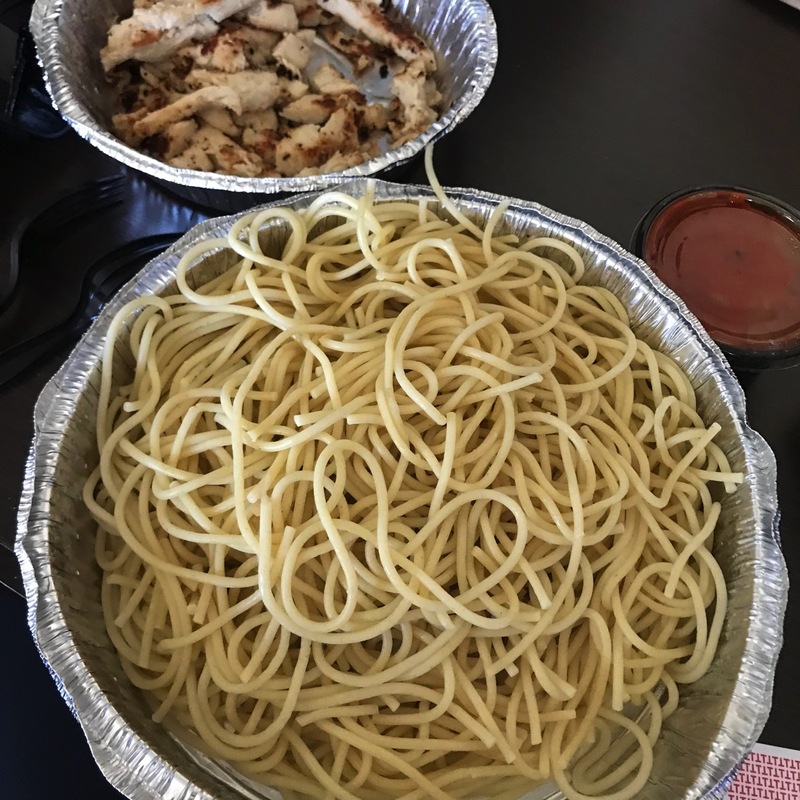 Spaghetti with a little bit of sauce and chicken. He also picked up Yogurtland because I felt like a little ice cream was just kind of needed. I got into bed at 9 and fell asleep for a second and then woke up and was up for a while. I decided to read from my scriptures for a while and I came across this scripture and it was just what I needed to fight some of the anxiety I was feeling. Not going to get too churchy but it reminded me of how much God cares about the things we care about. It reminded me to pray throughout the race and to feel gratitude to God for being able to be there and healthy. When I prayed that night I asked for help from Him for my pacing, so I could be smart and I got it. This is what I took with me (minus the sunglasses… the sun never showed up:) and somehow it all magically worked out. Oh and my Koala Clip isn’t in the picture but it was definitely with me and I didn’t even feel it. Thank you guys for telling me about that. It was so nice not using a fuel belt and using that for my phone/music and then putting my gels in my pockets. Let’s talk for a second about shoes. I woke up at 3:15 because I couldn’t sleep and then got out of bed at 4. I ate three pieces of bread, gatorade and water and then made my UCAN (300 calories of it) for the bus. I ate a gel and took my Nanohydr8 about 15 minutes before the gun went off. I probably ate/drank about 800 calories before the race which might have been more than I needed. I had some cramping from miles 16-21 but I was determined to give my body plenty of energy because I have blown up too many times in the marathon because of not taking in enough the morning of the race or during the race. I took my first huma at mile 6, then one at mile 12, one at 19 and then I tried one at mile 23 but that came right back up. There is a lot of TMI in this post so skip the next part if you want because I’m going to get real. When they started the 10 second countdown for the race to start and they got to 6, I thought oh my goodness… I have to PEE. 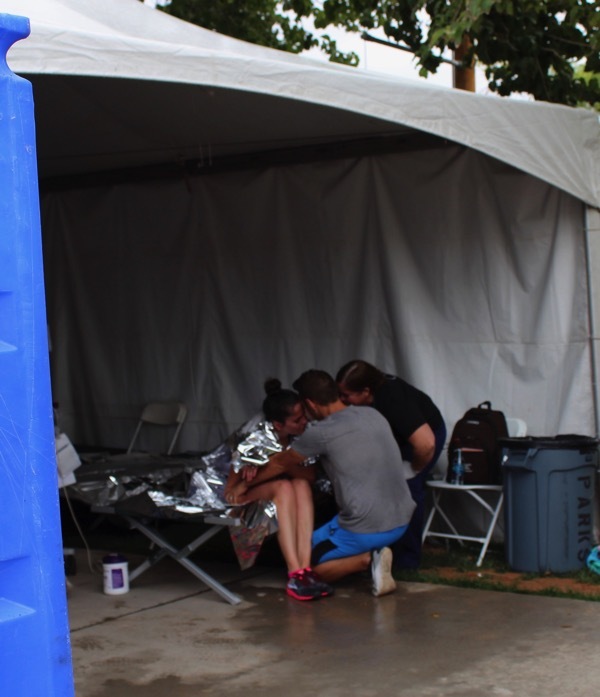 I drank too much before and rather than take the time during the race to use the porta potty I figured it was raining and yeah… not my proudest moment… I wanted that sub 3 and you gotta do what you gotta do sometimes. It could have cost me my time if I did stop. Andrew dropped me off at 4:45 and I went and got in line for the busses (my niece was with the girls while they slept and Andrew dropped me off). I wrote these things on my arm before starting and it helped so much. 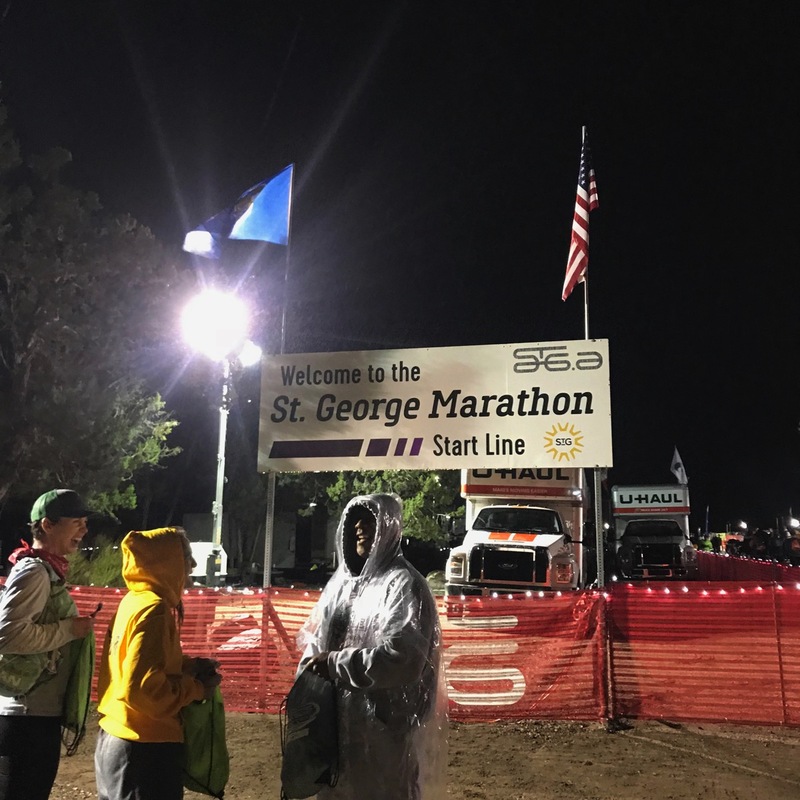 I kept thinking about St. George 2015 when I found out the week of the race I couldn’t do it because of my stomach problems. I just felt so grateful to be there this year feeling healthy and stronger than ever mentally and physically. I accidentally stole something (don’t worry… I paid for it after the fact:). 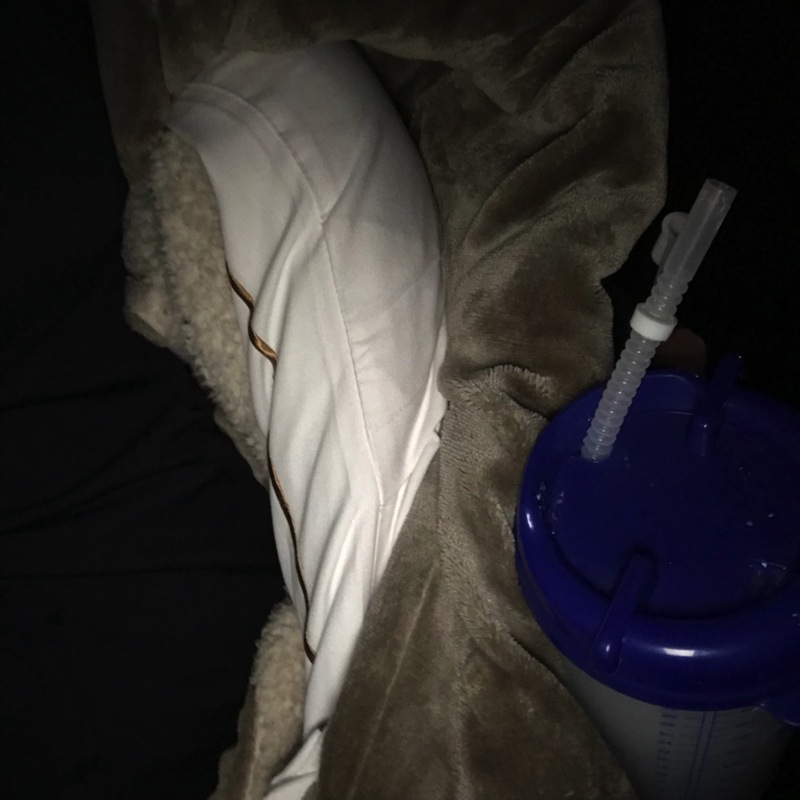 I grabbed my big blanket to take to the start so I wouldn’t be cold (and then left it at the top to be donated once the race started because it wouldn’t fit in my drop bag) and turns out that I had one of the hotel decorative pillows wrapped in the blanket. I think my brain was thinking about other things so I had a large blanket and pillow with me ha. The busses were very late which made the race start about 30 minutes after it was supposed to. It was raining the entire way up and freezing once we got to the top so I really didn’t mind the later start but if it was one of the hot years, that would have been really bad. The weather was magical this year. It was what every person prays for on race day. Cloudy the entire way, a bit of a tailwind (except for a headwind for a few miles), drizzling until mile 14ish and in the 40s and 50s. 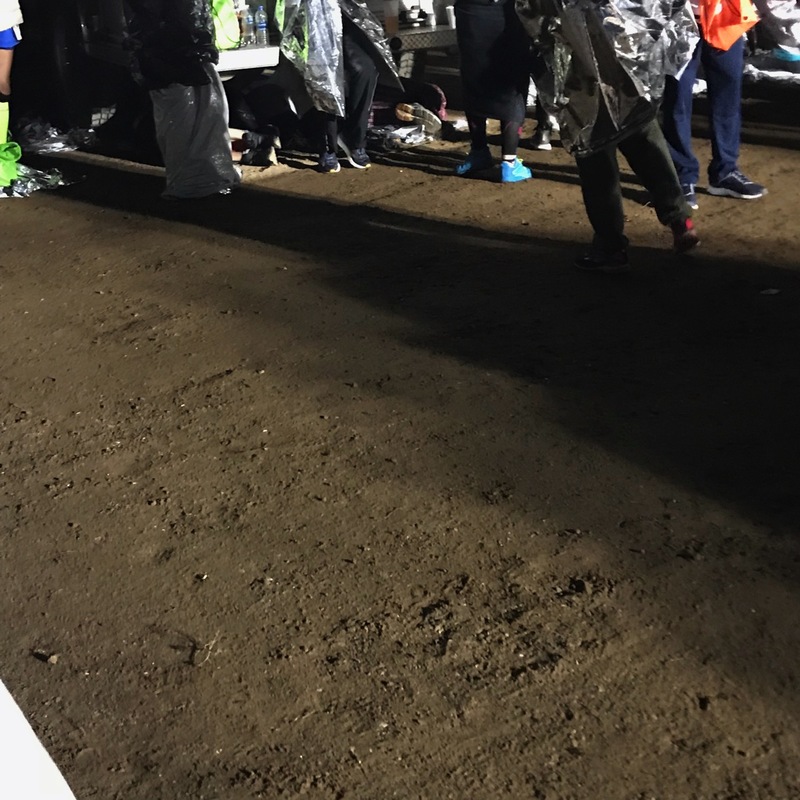 There were points where I felt pretty cold, I stepped in a big puddle in the first mile and at mile 11, it was raining pretty hard but besides that, it was perfection. It was so cold that people were underneath the fire truck cuddled up! I will always take a blanket to the start of marathons now. It just felt comfortable and so warm. I met a few people at the top and found a quiet spot to give myself a pep talk (out loud.. I’m not kidding). I felt a lot of peace right before the race started. I felt calm and just relaxed. It was so different than any other marathon. The race started and we were off. I held back the first few miles which took some major discipline. The first 10k went by really fast. It was raining and I was watching out for puddles and finding my place. Seeing my family at mile 6 was everything. Andrew, my girls, my mom, my aunt and my niece were there cheering like crazy in the rain. It gave me the biggest pep before Veyo hill. Andrew brought my Ricochet just in case my feet were hurting in the Hyperion. I gave Andrew my gloves and arm warmers at this point. I told myself that the first half was just a workout. The race was going to start at mile 13. Miles 8-12 are by far the hardest part of the course and you feel like you are climbing forever so I didn’t look at my watch much during these miles and continued an even effort which meant my pace slowed down quite a bit. I was happy I did that because that meant my legs still felt good at this point (rather than trashing them on Veyo–> 260 ft climb in about 1.5 miles). I didn’t listen to music the first 13 miles. When I got to the half-way point I felt like it had gone by SO fast already and like I was just starting which I was very thankful for. 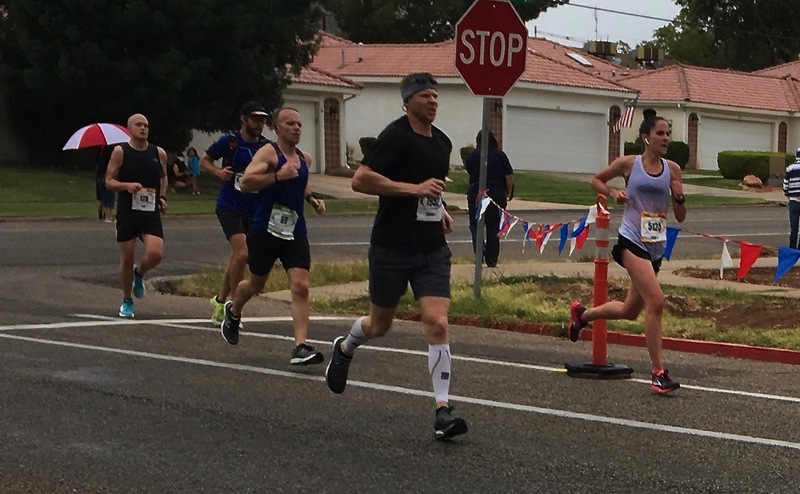 There were so many times throughout the race that I would stare at runners in front of me and watch as their foot hit the ground and how it would propel them up into the air. I loved studying how long their stride was and watch their arms swing back and forth. I would think about how amazing it is how our bodies work and that my body was doing that same thing I was watching. So if you saw me staring creepily at the people in front of me and their calves… that is what I was doing. I was so fascinated watching people run and kind of got lost in that for a few miles. At about mile 14 the 3:05 pace group was right behind me and that freaked me out and helped me pick up my pace a tiny bit. I was supposed to see Andrew and Co. at mile 16ish but they made it 2 minutes too late (you have to buy a pass to get to that part and people were doing it the day of so even though Andrew already had a pass, he had to wait in a huge line) BUT CANDICE and her family drove down just for me for the race. They gave me such a huge boost and I can’t say thank you enough to them for all coming down. I didn’t get a picture with Candice and I am so bummed about that but her daughter (12 years old) took the most amazing pictures of the day and I am so thankful for them! And then I said to myself, absolutely no. No way. Nope. I came for a sub 3 marathon and I was going to claw, and fight and do whatever it took to get there. I was not going to give myself an excuse out of my goal. I knew I was capable and that I would feel awful afterwards after being this close and not getting it so I dug so deep and fought. I repeated, “I CAN AND I WILL” over and over again. My feelings turned to machine mode. I mentioned before but my stomach was cramping big time from miles 16-21. I’m not sure why but I just did everything I could to not think about the cramps and think about the mountains or the people or how great my breathing was or how awesome I was doing. I cheered myself on and learned so much from Deena’s book about pushing those negative thoughts out replacing them with good ones. It was life changing. Finding the goodness… so helpful. Miles 23-24 were my fastest of the entire day—> 6:22 and 6:21. They also included a lot of downhill in those miles! I thought a lot about my family and how much they have supported me and that I wasn’t going to have them do so much for me and not hit my goals on Saturday and that is what fueled those miles. Plus seeing Andrew and my family really sped me up at that point too. I also felt really good those miles compared to many of the previous miles. 16-21 were a big struggle for me so to get a pep in my step felt really good (except I couldn’t keep a gel down). I grabbed the ice bags that they were handing out (even though it was cold) and stuffed them down my sports bra or put them on my head hence why my shirt was drenched at the end. I took water and gatorade throughout the course and spilled all of it on myself too. The last mile turned on me really fast. My eyes went fuzzy and I felt like I was going to fall. I remembered something Desi said on a podcast—> left foot, right foot, left foot, right foot and repeated that to myself for a while. It was simple and it reminded me that is all I needed to do. It wasn’t anything complicated, I just had to keep going. I also thought about my upcoming cheeseburger at one point during that mile and how good it was going to taste. My mom said at this point she has never seen me look so determined in my entire life. I was not messing around. I was going to make this sub 3 mine. The last 2 miles—> 6:31, 6:56 and a sprint for the last .2. My legs felt dead and so I pumped my arms harder to get there. My mom yelled LIGHT IT UP NOW at this point below and that was awesome. When I went under the clock at the finish line and saw a TWO as the starting number, I put my arms up and felt like I just won the Olympics ha.. it felt like a dream. The second I crossed the finish line I told the volunteers I just needed to lay down. And I did. Then Andrew jumped over the barriers because he was worried about me and I hugged him for a while. Then somehow I got over to the med tent because I felt so terrible and had a hard time really talking or standing. 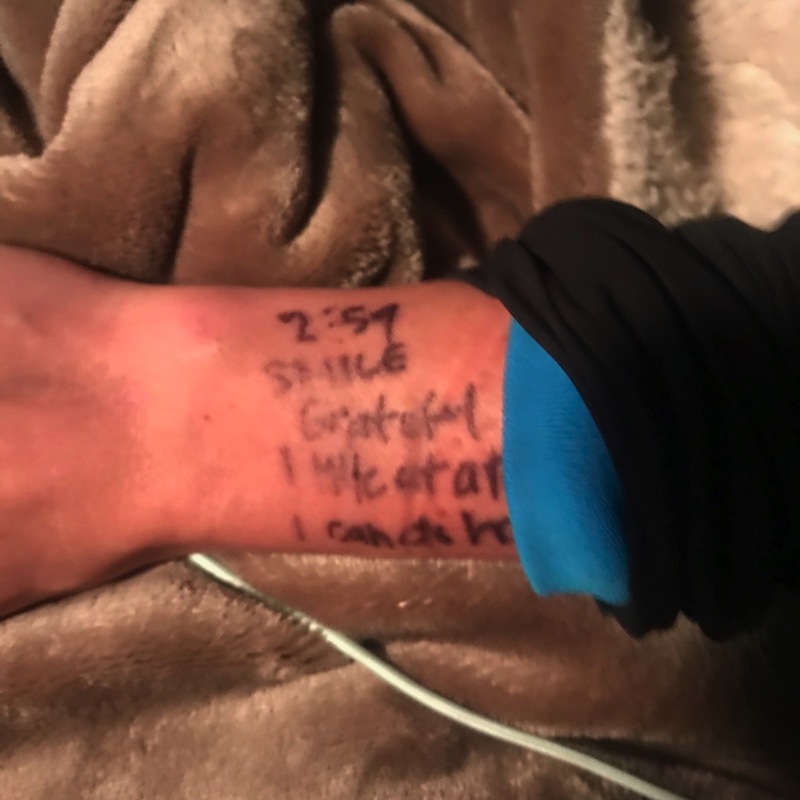 One of you told me the day before the race to leave it all on the course and I remembered that at one point and it really helped me to leave it ALL out there. Once in the med tent I just kept saying I needed to take a nap and I would close my eyes and feel really tired and then they would get me up again and make me sit up. They gave me chips and a coke and after about 20 minutes I felt a lot better and like I could walk again. I left it all out there and who knows… maybe physically I wasn’t fully ready for a sub 3 but that just goes to prove how much our mental fitness matters because mentally I wasn’t going to settle for anything different than a sub 3 (and luckily the weather cooperated perfectly with my stubbornness). Andrew. 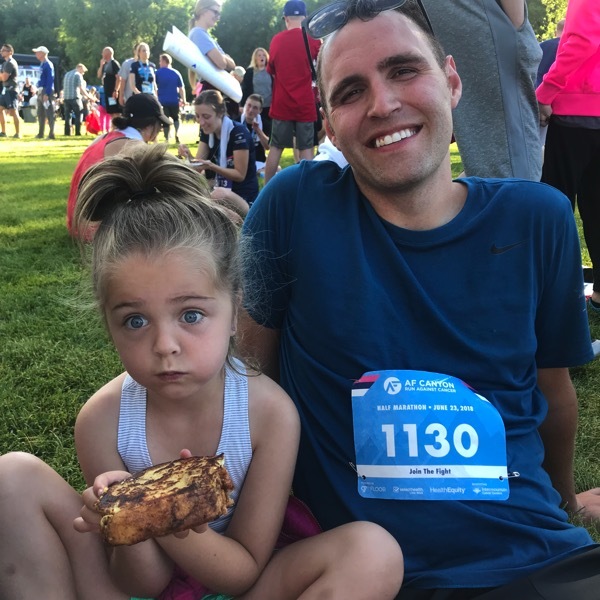 So he was signed up to do this marathon but he decided not to run it so we could just focus on my training for it with the kids and everything. That means he took over night time stuff with the kids for the last month or so, he was doing mornings with kids if they woke up while I was running, he rode his bike with me during many miles, he gave me so many pep talks, massaged my hamstrings because they were so tight a trillion times and was probably more nervous than I was for the race. I am extremely lucky. My mom has been my cheerleader, babysitter when Brooke was little for thousands of miles and listening ear this entire journey. To have her there cheering me on meant the world to me. My dad wanted to be there but wasn’t able to make it but I remember at mile 22ish repeating, ‘Dad, dad, dad, dad” and thinking about getting an ‘Atta Girl’ (the biggest compliment he gives for really special things) if I did get my sub 3 and that was quite motivating. It made me smile when I thought about my grandpa who was a runner and cheering me on from heaven. We just cried together when we first hugged after the race. When Knox found out that he wasn’t going to be there he said, ‘will you imagine me there?’ And I did, a lot. Seeing Brooke and Skye meant a lot to me and I just wanted to make them proud of me (I’m sure Skye was bursting with pride for me;). 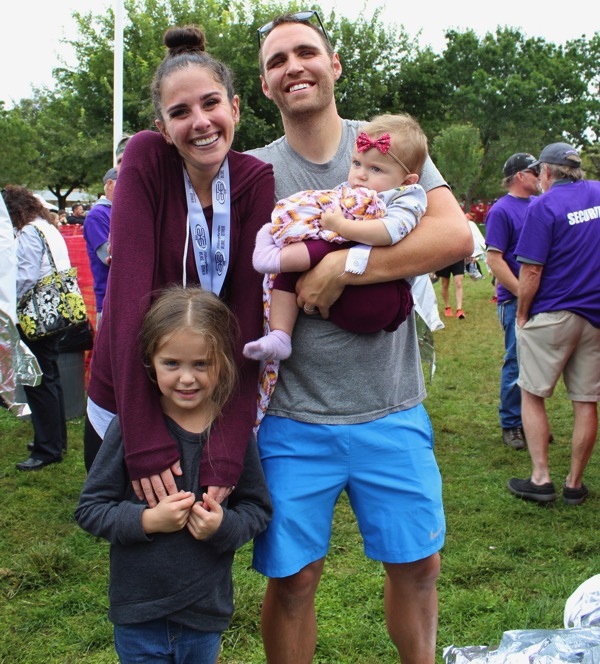 My aunt is a big runner and she signed me up for my first 1/2 marathon in 2006, my niece helped SO much with the girls so Andrew could be there for so much and we are very close. I thought about my runs with my sister over the years. My brothers, sister-in-laws, brother-in-law have always been so invested in my training and helped me a ton! 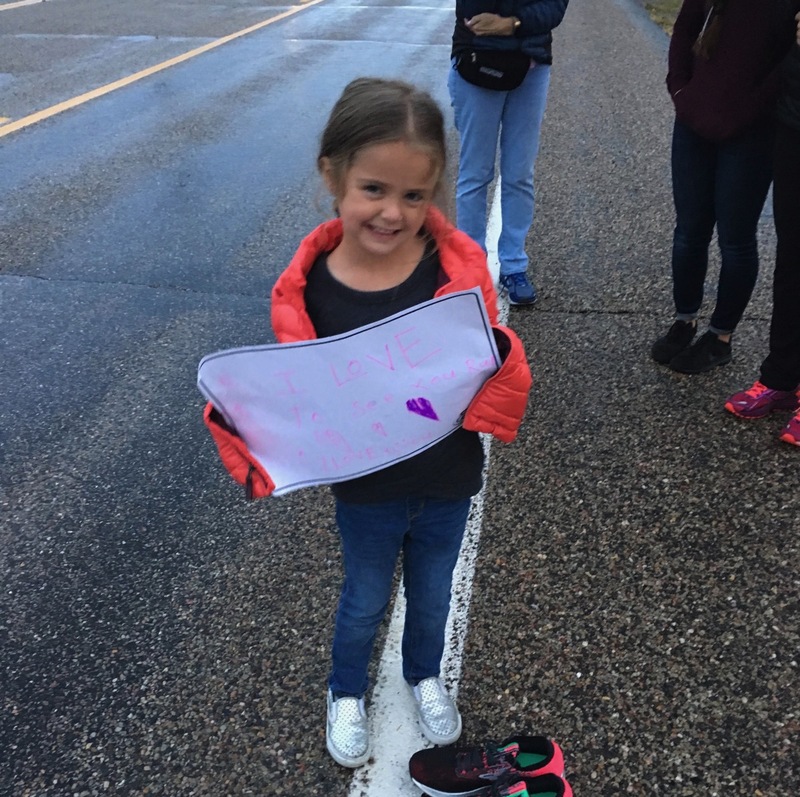 Andrew’s entire family has been cheering for me doing this since I first told them I wanted to do a sub-3! I thought about my friends and how much I love them and how supportive they are. 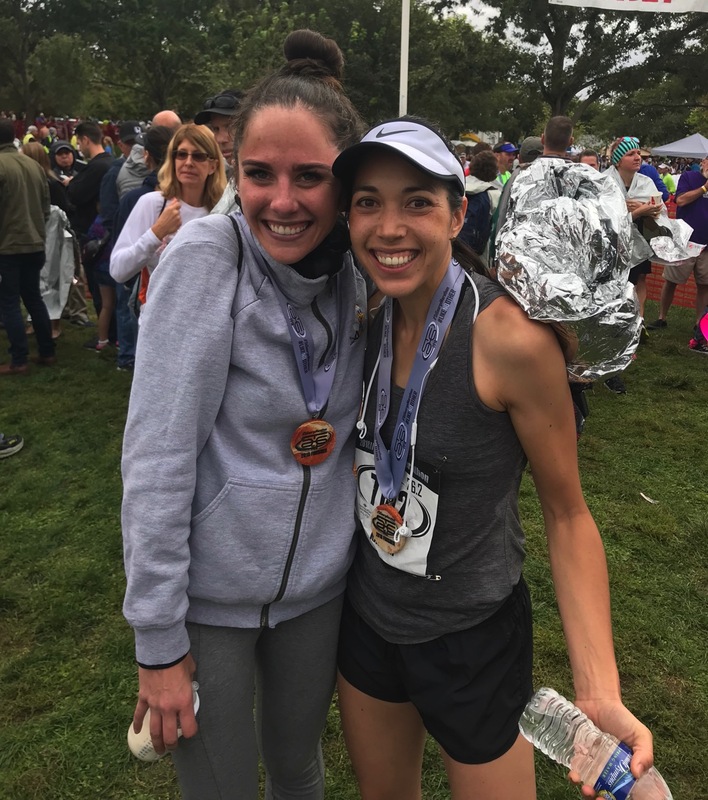 Bangs friend SMASHED her first marathon and finished in 3:33… WHAT!?!?! She killed it and I’m so happy for her. Josse came even though she is injured. I’m thankful for all the training we have done together over the years. She’ll be back and I can’t wait to train together again. Burgers, fries and milkshakes after the race and then the best diet coke and candy that I have ever had in my life. I really worked on my nutrition this training cycle so these things weren’t a part of my life for a while there. Soda won’t be a regular but I’ll have some good candy until my next training cycle starts again. -I felt absolutely terrible during the taper. I tried not to think about it too much to avoid negative thoughts but seriously… my whole body just felt awful. I cut a workout short during the taper and I just wanted to sleep forever (could have been partly because of my period too.. which literally ended the night before the marathon #lucky) but just remember that during your next taper. 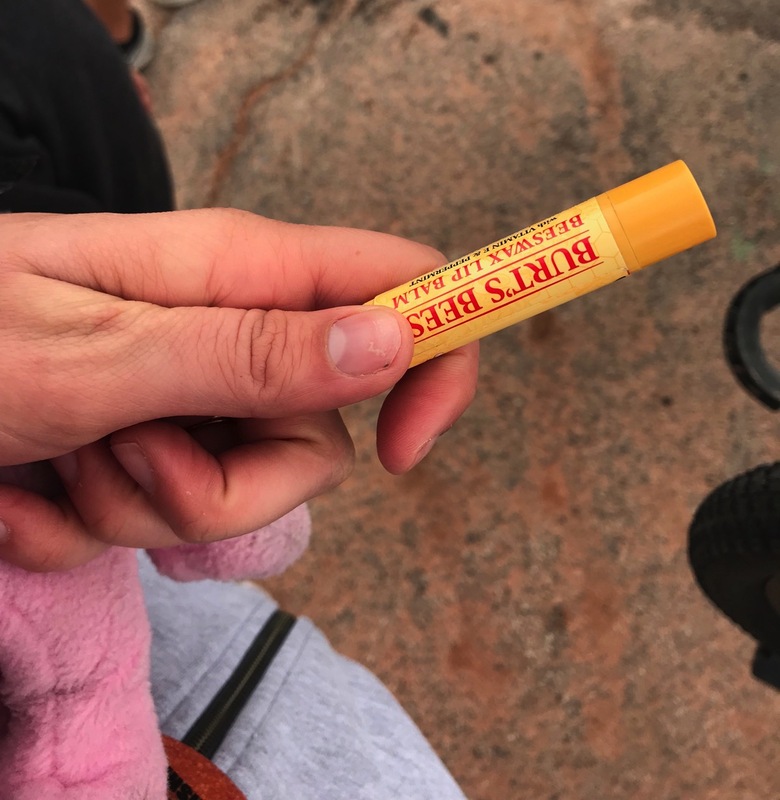 -I brought my lip gloss in my pocket and used it during the race (I have a problem) but then I couldn’t find it afterwards so my aunt handed me hers. It felt so crazy good. –Mary is a beyond amazing coach. –Dr. Bennett has helped me over the years to stay healthy and injury free big time. 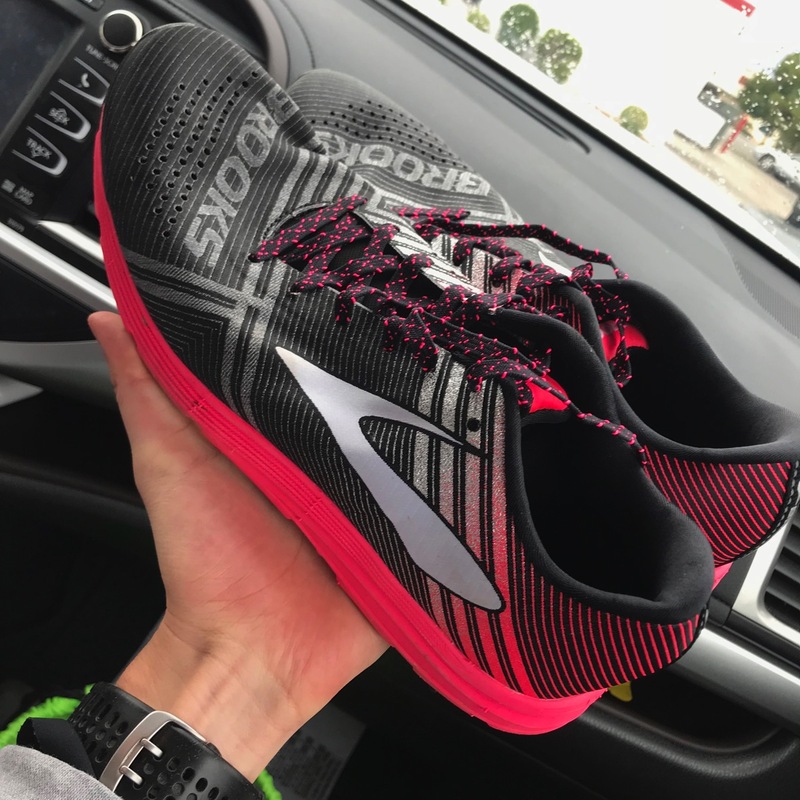 –Brooks has been the shoes keeping me running happy for 7ish years. -I saw Jared Ward at the finish line (he finished SIXTH at the Rio Olympics in the marathon) and felt starstruck. I told him that I finally reached my sub 3 and he was so excited for me. I listened to his podcast with Tina on the way to St. George and went to his lesson/talk at the expo and it was amazing. He talked about how feelings of fear and anxiety are you living in the future and how important it is to be right where you are in the moment. I used that a ton during the race. 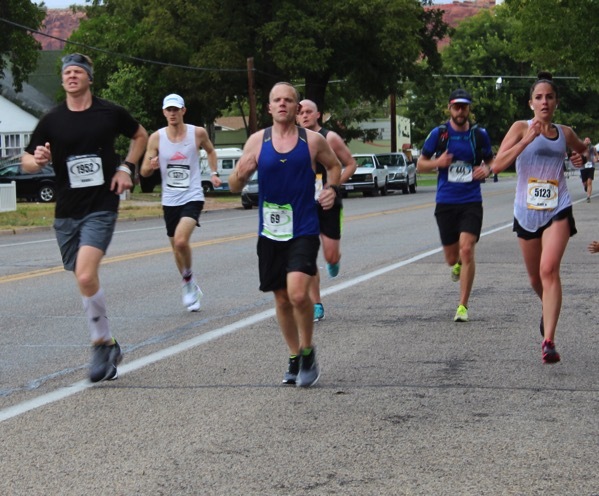 When I started freaking out about 12 more miles to go or how I was going to have to run a sub 7 minute mile when I hit the wall… I just kept thinking about how I need to jump out of the future and back into the moment. It was incredibly helpful to be just where I was, to make it to the next lamp post or to raise my chest and take a deep breathe rather than feel anxious about what was up ahead. His advice really helped me out a lot during the race. -The weather was unreal. It was perfect. Just had to say that again. -It feels good to know I raced smart (for me) and that I left it all out there. -Power bun for life. My hair didn’t move the entire time. -That wall is a crazy thing. It felt like I was out of my body during that point. -A 14 year old ran a 3:13 that day! -During the final mile my song came on. I had a 3.5 hour playlist I was listening to (and only had it on for less than 90 minutes) and right at the end (it was on shuffle) my song came on. It’s the one song I’ve listened to throughout all of my marathon training cycles (starting 8+ years ago). It’s kind of creepy how it came on and it made me smile and just feel kind of weird inside because it happened so perfectly. ‘The Quiet Things That No One Ever Knows’ by Brand New. I can’t tell you how many workouts this song has gotten me through and it was crazy special to me that it popped up right when it did. From this point forward I am pretty sure I will start crying every time I hear this song now. -All of this training, all of the time… what makes all of our running actually worth it? It’s not a certain time on the clock, it’s overcoming something. It’s proving to ourselves how strong we are and overcoming the desire to quit that makes me come back for more and more running. We beat ourselves and the voice in our head that sometimes tells us we can’t. That is the feeling I keep coming back for and will keep coming back for as many years as I can. -I’m going to avoid stairs for a while. A long while. -Sitting in a car for 3.5 hours after a marathon makes it pretty impossible to stand up afterwards. -Thanks sissy for making me go on a run with you 20 years ago. -This marathon will always be my favorite. Between the amazing course support, spectators and the incredible views… I love it so so much. -The majority of this training cycle I was on my own. My hard workouts mid week were always by myself and I think those really helped me out on Saturday. Learning to do it on my own and what mental tricks worked for me was so beneficial for the race. I got to know myself a bit more during all of those tempo miles and track workouts and learn what makes me go. -I have never worked on my mental game as much as I have this training cycle and it really paid off. Not only did it help me get my goal but it helped me to really ENJOY the entire process to get there. This will continue to be a big part of my training over the years. Thank you everyone for everything. I want to send you each your favorite treat and flowers for helping me out so much. I hope your week is amazing! I’m always here to cheer you on like you have for me. Who raced this last weekend? Where and how did it go? If you do like soda… what’s your favorite kind? And definitely don’t apologize for being “too churchy” you are not at all. In fact, would love to see a post on your faith/general conference! I think it would be very interesting. Same thoughts! 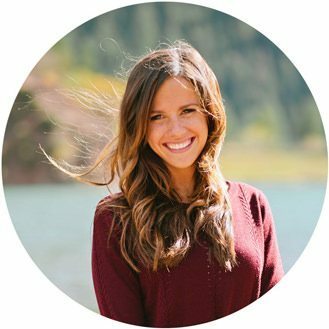 I’m not Mormon (I am Christian) But I really really enjoy hearing the verses and thoughts about faith and God that you share on this blog. I feel like it is such a big part of who you are, and why you are successful in life. You share other things that help you -running shoes, gets, inspirational quotes, music selections… I think its only natural that you include those aspects of your faith that help you. I personally would love to hear about conference and any special lessons that were meaningful to you. No races for me but I ran ten miles in the rain and I can’t say that I particularly enjoyed that, but it’s supposed to rain all week here so I guess I better learn to deal with it! Buy sour patch fruits and put them in the freezer.. then eat them once they are frozen. SO. GOOD. You captured it all so perfectly too. I did the LA Marathon in 2014 and felt so much of what you wrote tho my time was no where near a <3. Andrew and your supportive friends and families = gems! Your spirit and tenacity also a beautiful thing. Good job Janae – so happy for you after the last set of rough years – I’ve been reading for a long time, haven’t posted tho until this week. You’ve overcome obsticals in a statement making kind of way. Keep it up girl! I’m so so unbelievably happy for you!! You are amazing and such an inspiration!! Been following you for years and I’m so happy to see you achieve you dream of a sub 3, you’ve earned it!! Amazing, amazing achievement!! Congrats! So excited and happy for you! And getting butterflies, hoping I can make it through mine in 2 weeks. Ankle/heel pain kicked up in my run Saturday. ARGH! Resting/icing/stretching/rolling and hoping it goes away. Better now than a week from now…..
BEST POST EVER!!! You so inspire me, I already messaged you on IG but knowing you got your sub 3 helped me push my own personal hardest in my half yesterday. So very happy for you, you so deserve it and what an amazing tribute, too, to your support team of family and coaches and dr. I have that, too, and am beyond grateful!!! 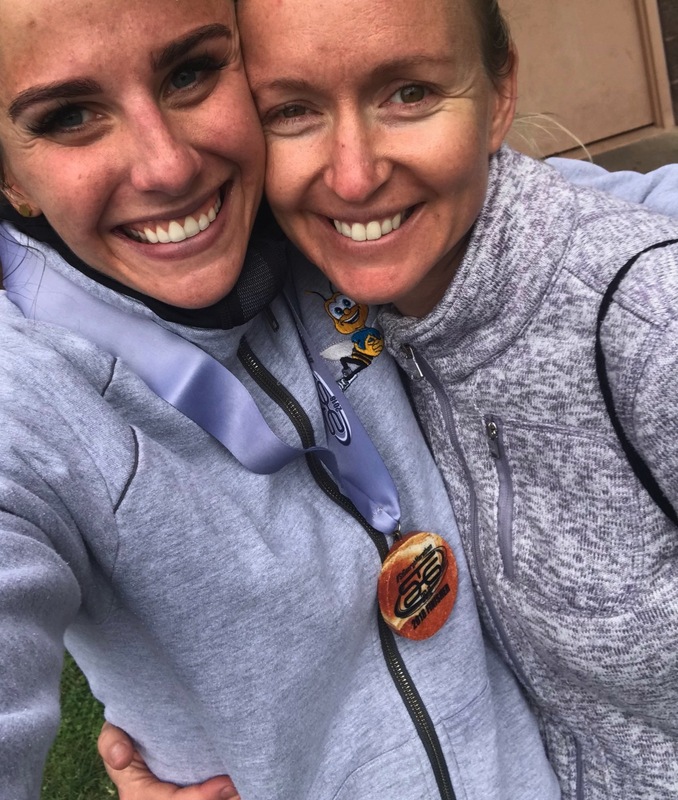 I hope that when you are 50, like me, you will look back on that race with happiness and just remember all that you accomplished was so incredible, and when you had the chance for the ‘easy PR’, you dug deep and pushed for more! Trust me when I say that with age, comes more challenges in being able to push the pace, so keep on fighting and running smart like you are….many happy miles and years of running!! Got goosebumps reading this. SO happy for you! So excited for you! I cried happy tears for you through reading that. I also love how much you gave credit to those that helped you. You are so strong and determined. I loved this recap so much!! Congratulations! You crushed this race and made your goal! SOOOO inspiring! I have read your blog for awhile now (maybe since 2013 or so?) and am SOOOOO incredibly happy for you. You inspire me all the time, but I got so choked up reading about your experience. You earned this 100%. I also think it is wonderful that you have such a rock star hubby and family! I LOVED that your mom yelled “Light it up now!” So crazy cool. Congratulations again!! amazing race, janae! ive been a long-time follower so to see you work so hard and chip away at this goal you’ve had for so long is such an inspiration to me! i was supposed to run chicago yesterday but injury got the best of me and i ended up a spectator. this is the second time i got injured during a marathon training cycle so next year is MY YEAR to cross the start and the finish lines! 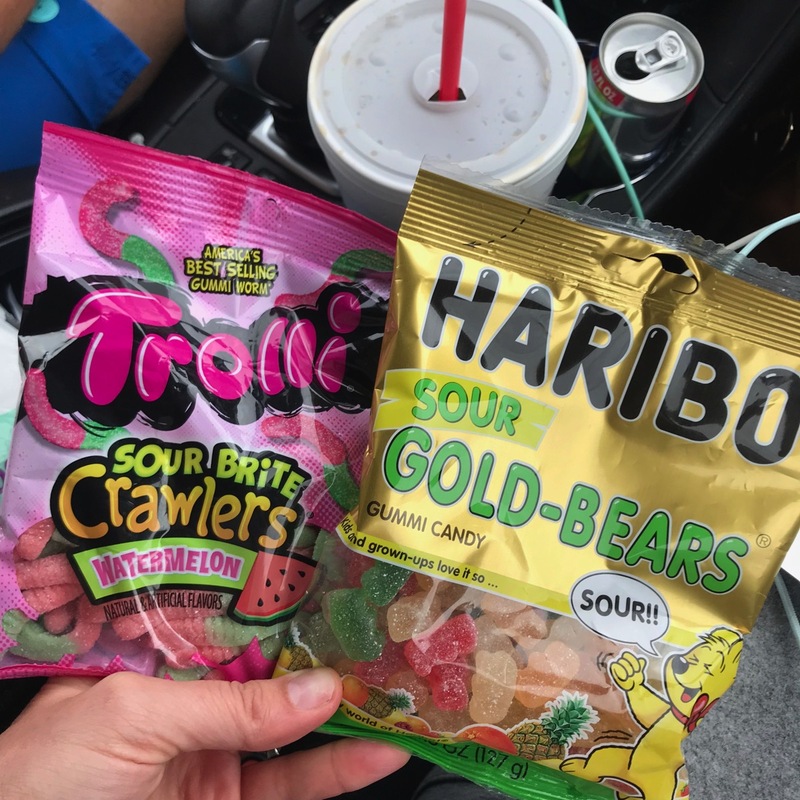 as for candy… SWEDISH FISH! Congrats!! So proud of you! I cried while reading this. You so deserve it. Waaaaaay to goooooo! What a strong finish and awesome negative split to your race! I was checking Instagram all day looking for your update on how it went! Gets me excited for my training and my race in December to see/hear about your race. Long time reader — CONGRATS! Wonderful to see you reach your goal! 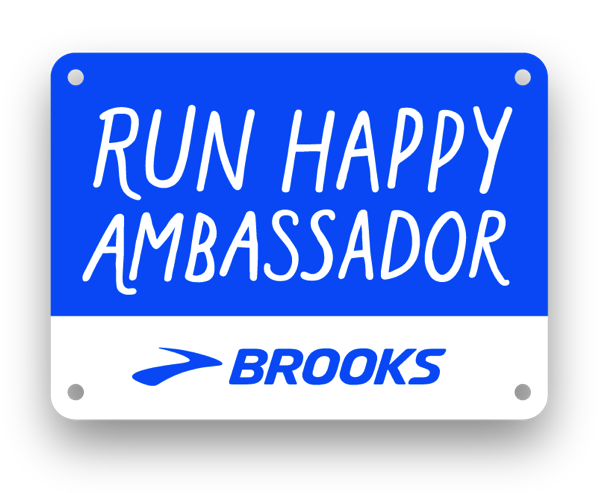 Oh my goodness, I’m not a runner by any stretch of the imagination but I found your blog years ago and have been following along ever since, because I love passionate people. CONGRATULATIONS!!!!!! Your mom has always reminded me so much of my mom and when I read the part about her yelling “Light it up now!” I had tears streaming down my face. So excited for you!!!! I didn’t cry at the insta-stories or posts, but this recap… tears!! Yep, I agree, best.post.ever!! So so so extremely elated for you!! You are an inspiration in your running and as a person and help me so much in staying focused in my goals and overcoming injury. As you said, your support group is amazing!! Family and friends who are so supportive and encouraging is everything. Congrats to bangs friend – what a perfect day!! Oh man! I started reading your blog years ago and then fell out of the habit of reading blogs, but kept following you on social media. I’m hooked again! You had me crying when your mama told you to light it up! Great job!!! And now I know I need to read Deena’s book! This weekend we took the girls to Busch Gardens so I did my long run (13 on Friday morning before work). I’ve got a 25K October 20 and a 30K the following day. All trails – it should be fun. One of my favorites is Starburst jellybeans!! So yum! Congrats and have a great week! Congratulations Janae!! I’ve been a long time reader and I got teary-eyed reading this post! You’re such an inspiration to set hard goals and to persevere even if it takes longer than we think it will. I was literally tearing up reading this. Is that embarrassing for a complete stranger? I’m so happy for you- I love seeing other women meet their goals! CONGRATS!!! THAT IS ALL…YOU KILLED IT!!! OH MY GOSh!!! I have tears running down my face- YOU DID IT!! You are such an inspiration to everyone out there and a great example of what happens when you put the work in. Solid work Janae! I am giving you a big big hug right now!! I cried reading this. I have been following you since 2010 and have always admired you so much. I am going to think of you and channel your mental strength when i run columbus in two weeks. I’m so happy for you! I have had two kids since my last marathon ( I have had three miscarriages mixed in so thats why I haven’t raced a marathon in 6 years!) but I understand what you mean about feeling mentally stronger after each kid. I’m shooting for a PR of around 3:10 – I know I will be thinking of this race recap when I reach mile 20 and want to relax! thank you for sharing with us! 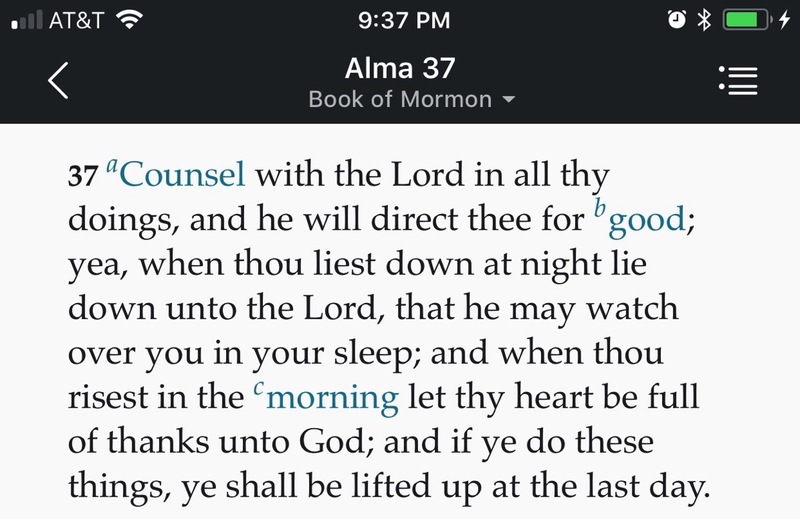 I love the scripture tie-in also. I usually pray the rosary to myself during the first few easy miles of a long run and even my last half marathon and I swear it helped! I’ve read your blog for years and years, from back when I started running to long after I dropped out of blogging myself. I’ve rolled my eyes at you, ached during your heartbreaks, this is why we follow blogs, I think–to be a part of someone’s life. I am filled with so much *joy* for you. And pride. I knew you had it in you, the ability, and moreso, the fire. You’ve proven again and again that despite the candy and rainbow text you are a hard working, incredible person, and you proved it again in this race. Thank you, for sharing this journey with us, and for believing in yourself. Congratulations! I loved this recap, so inspiring! I am crying along with you, so emotional! Congratulations! Way to go! I hope I can have a PR this year. I tried on Saturday, but I just did not have enough at the end to make it happen. It was sad for me. I love your brutal honesty in this recap and raw emotion. Isn’t it great to have such a wonderful support system!? I have that in my husband. Good for you! Congrats! Enjoy celebrating! Loved this post. I know I will re-read it many times (as a matter of fact I was almost late for work today because the post was so long and I didn’t want to stop reading it!) I loved how you had to call on all of your physical AND mental strength to reach this goal- much more fun to read about (and much more satisfying to you, I would imagine) than if you had just cruised effortlessly from start to finish. There’s so much here we can all learn from, and be inspired by. Moving forward, I have a couple questions. 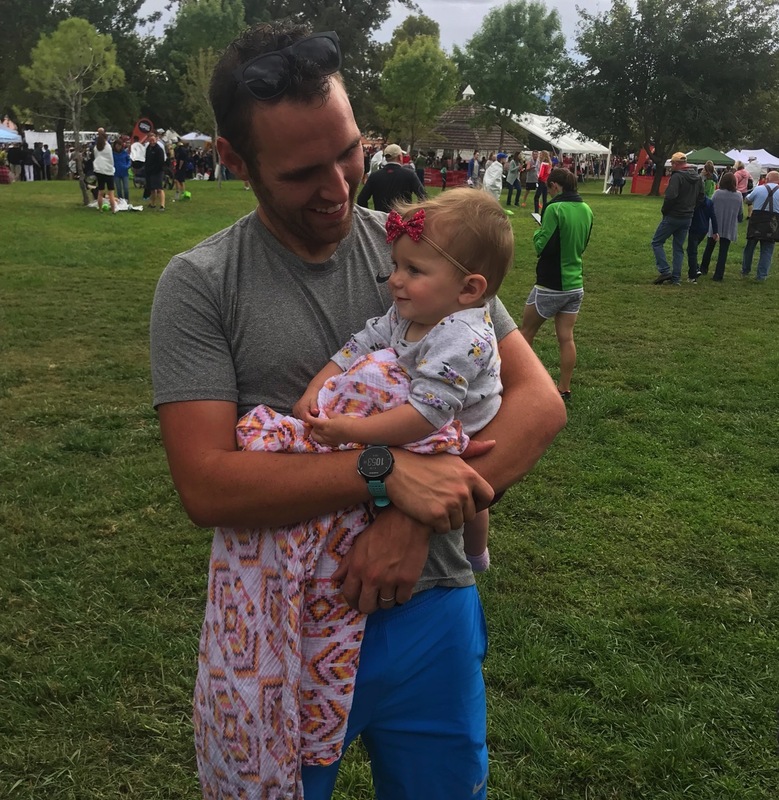 One, and right now this probably sounds insane, but I’m wondering if you will get a kind of “post partum” depression after all the excitement dies down- I’ve heard of this happening to runners who finally realized their big, huge goals. And two, have you started to think about future goals, or is it too soon yet? I’m wondering what it will be like to move on from here. Congrats, Janae. I have been reading your posts for quite a while now, and you are an inspiration. It’s an awesome feeling to get a sub three marathon! Enjoy it. 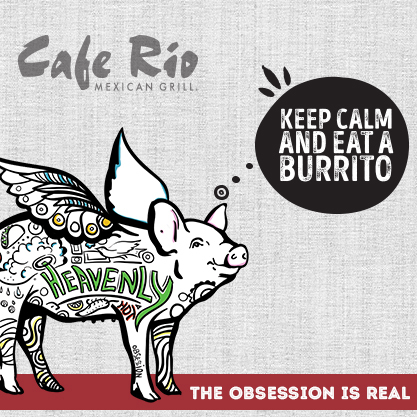 Your story can be summarized with four F’s: Family, Faith, and Freaky Fast! I’m bawling, Janae….literally have tears streaming down my face but with the biggest smile. Such determination. So fierce. I’m so happy for you. As a marathoner I totally get it. 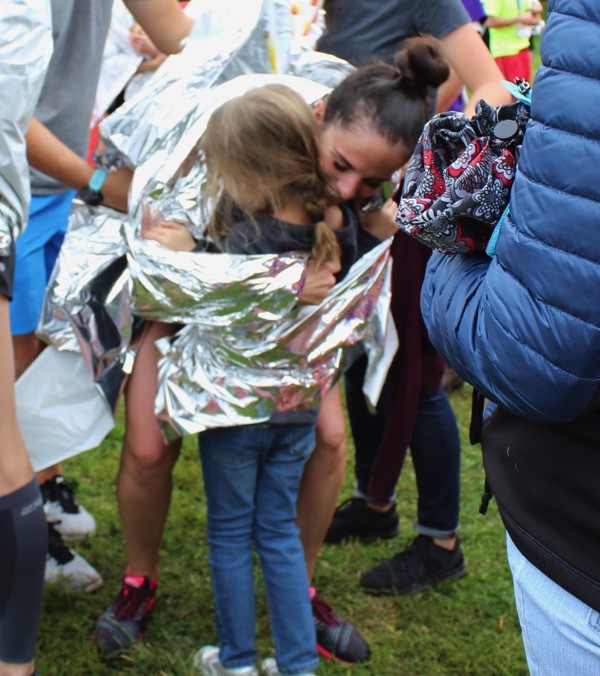 Yes….you put in all those training miles by yourself…but the support system you had for this meant you were never truly alone. Yayyyy. So happy for you. So happy to read this. Know it’s been a long time goal. Love this. What a wonderful post to read! It made me tear up with happiness for this huge achievement that you have worked and waited so long for!! You are amazing and an inspiration to so many. Congratulations, Janae!! Janae. This was an amazing recap. I’m so so happy for you. I’m not even a runner, and I’m currently on the way to see friends for a long overdue reunion, and yet I’m wiping the makeup smears as I cry through this. I felt how badly you wanted this and how hard you worked for it. It’s been fun to witness virtually. Pretty sure I just cried through your whole post!!! I have been looking forward to reading this all weekend! You were determined and look where it got you!! You had so many people cheering for you and supporting you through this whole training and race day! I love all the pictures and seeing all your family there! I LOVE and might steal the idea of writing on your arm!! LOVE that! Such a great reminder to have right there in front of you! Since its October, get you some candy corn!!!!! Enjoy resting!!! Again, HUGE CONGRATS to you!!!!! I’m so happy for you Janae! Ive been reading for a couple years now and really admire your strength of character! Congratulations on achieving your dream of sub 3!! Well the part about Andrew I just started crying. That’s just too sweet. I’m so happy for you! Congrats! Holy moly I loved every bit of this recap! You did it! Congratulations, Janae! I had the Long Beach half inbound Sunday and no lie, it was probably the hardest race for me, mentally. I knew going in I wasn’t fully prepared but because I’ve done the distance before, I thought I’d be fine. 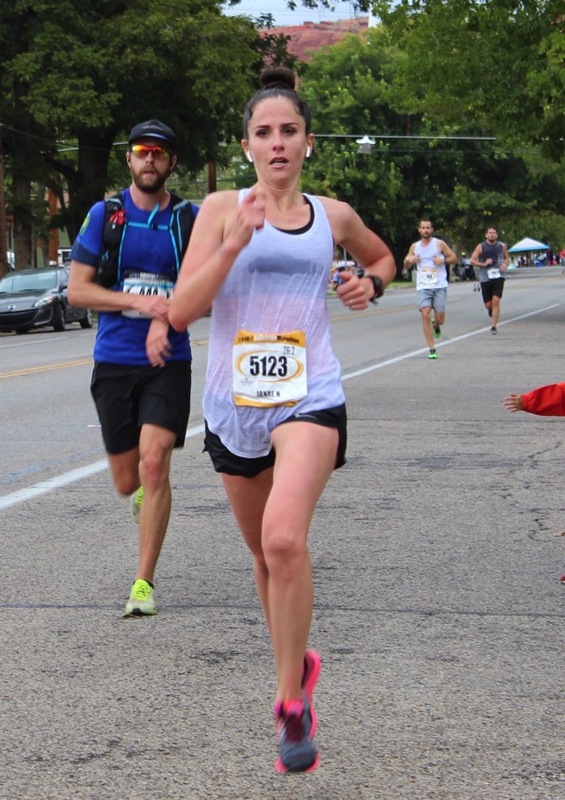 I’ve never had thoughts about quitting a race until yesterday and it made me feel disappointed in myself. I’m taking a long break from half marathons and will focus on 5ks and 10ks until I can train properly for another half. Haha funny thing about soda, during the last half of my race, all I could think about was a huge cup of rootbeer! Congrats Janae! 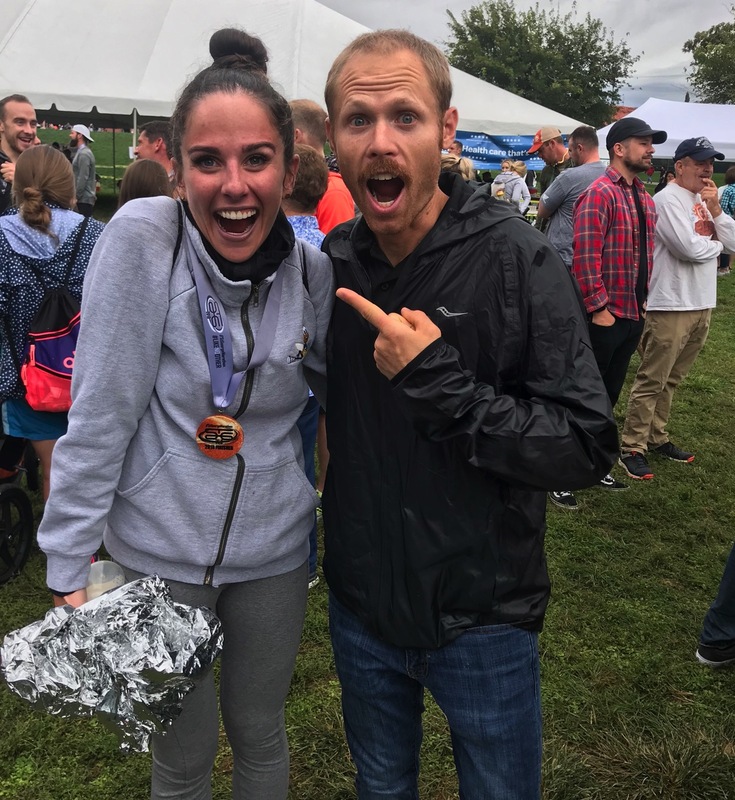 I have been following your blog since the beginning and I am so excited you ran sub-3!! It’s amazing to see your hard work pay off. I don’t comment often but I have been reading your blog since the beginning and was so invested in your sub 3! I was obsessively tracking you on Saturday and truly almost cried when I saw that you did it! 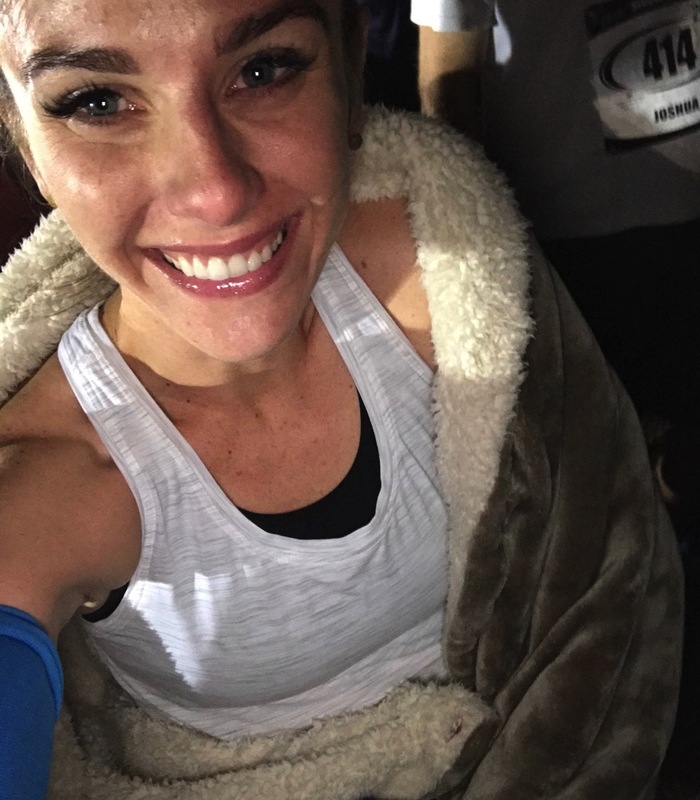 I ran Chicago yesterday, my second marathon, and my training went out the window last month because I had too much travel going on and a few small injuries. I decided to not set a time goal but to to instead run the smartest race I could. My time was not impressive, but I ran every step, kept every single mile at a steady pace (no more than a 20 second fluctuation across the whole marathon!) and completely nailed my nutrition. I ended up finishing 4 minutes slower than my first marathon but was still crying tears of pride as I crossed that finish line. Your paragraph about why we run rings so true with me right now! There is nothing great than overcoming your biggest obstacle, which often tends to be yourself. You are amazing! This gave me chills and made me tear up!!! You are defintely an inspiration-thanks for sharing your story! Ugh this made me cry <3 SO AMAZING JANAE!!!! You're just amazing and inspiring!!!! Congratulations!!!! So happy for you! And I was crying looking at that picture of you and your mom! I have been following you from the beginning and I’ve watched you’re whole journey and as I sit on my couch in New Zealand with tears rolling down my cheeks, I just can’t help but feel so incredibly proud of you! Yay! You did it and you earned it! So happy for you! Thank you for the koala clip tip! I will have to try it. Did you just put your fuel in your short pockets?? If so, what kind of shorts were you wearing? OK now favorite candies: I should really stay away from reeses peanut butter cups because of a potential mild peanut allergy, but I can't help it. My preferred version of them is the little plastic tub of them that's always available at Trader Joe's. I also love gummy cherries like it's no one's business, and I have had an obsession with m&ms for quite literally more than 75% of my life. As for soda–the last time I drank soda was, quite literally, February 6, 2013. I *sometimes* crave a diet coke, but I can't let myself drink one. I would get too quickly and easily into the land of Soda Addiction. So I drink La Croix and I drink regular water and iced green tea unsweetened from Starbucks! You’re amazing; congrats! I highly recommend ‘fizzy cola’ gummies from Hairibo. So good. 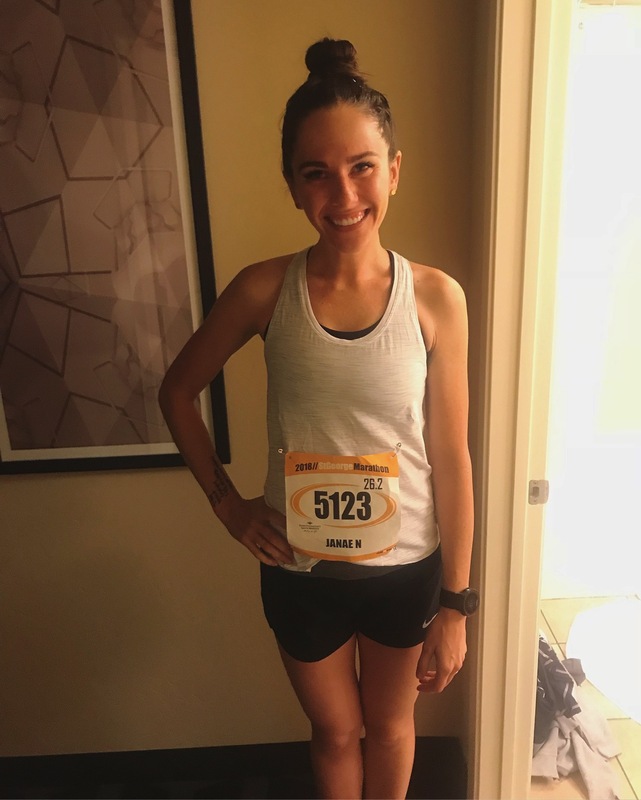 I ran Chicago this weekend – it was awesome! Ive never had such crowd support. Plus I had a 15 minute PR! I’m aiming for a sub 5 marathon…it’ll happen, I’m determined. 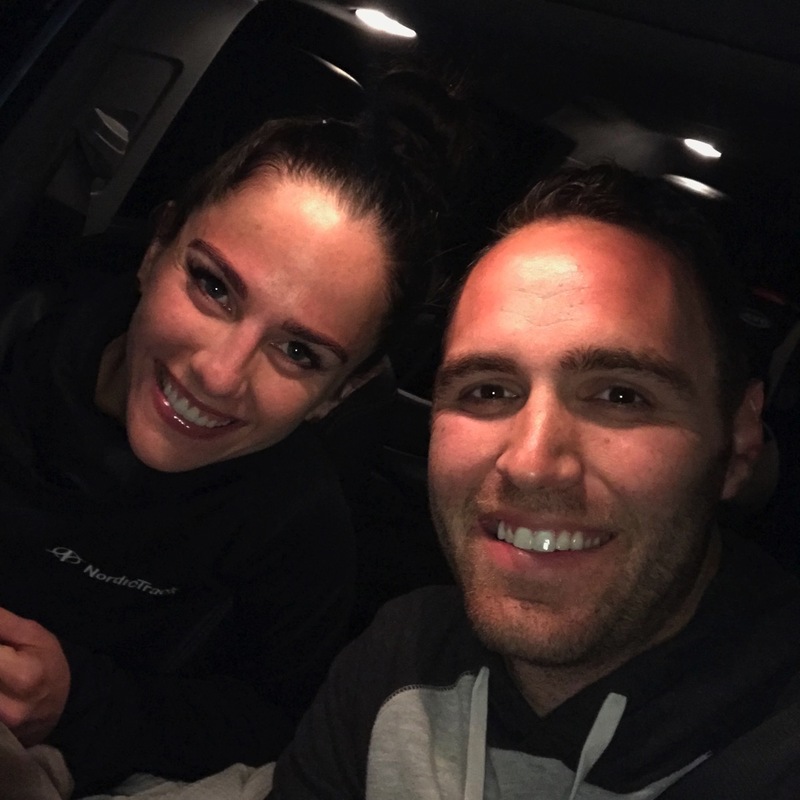 I took a break from your blog for a few months because I had to take a break from training and work out my own issues with my leg and marathon training…. My leg has almost healed, and today I felt I just really needed to get back and see what you were up to– “Did she have her race? How’d she do? ?”– and I return to this post. :) Meant to be. You did it, Janae. Nailed it! Congratulations on a dream solidified, girl. You did it!! And LOVE the reflections afterwards on running! Congrats! You are such an inspiration. I look forward to reading your blog everyday. I am so happy for you and this major accomplishment. Thank you for showing and sharing all that is possible! Congrats again! You simply ROCK!! Congratulations, I knew you could do this! I ran the Hot Chocolate 15K in Denver on Sunday – my fastest 15K to date 1:27:15. Far from your amazing pace, but at one point when I was feeling a little distracted I said, if Janae can hit her goals, so can I! 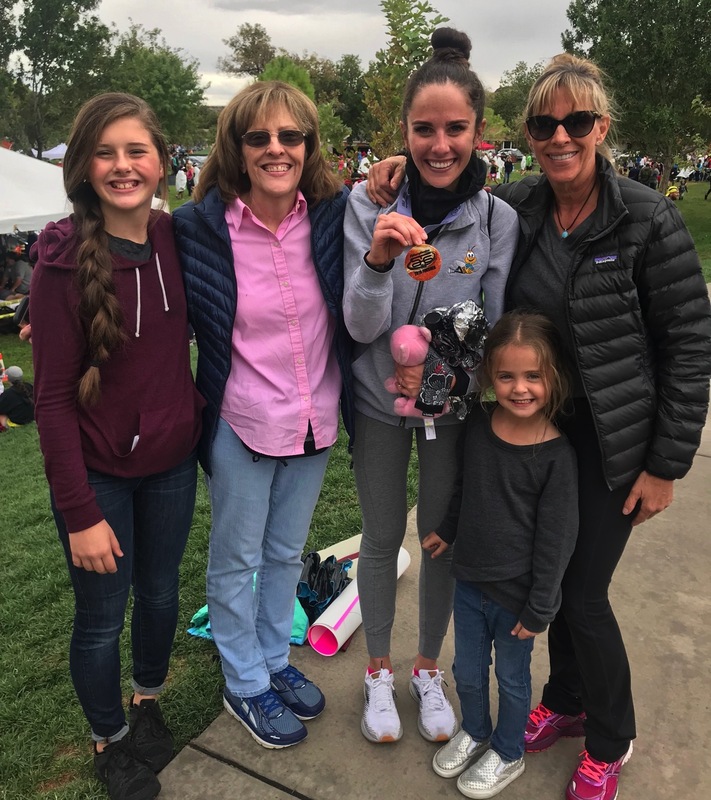 This was my first ever race where I had no spectators there – so I imagined them there with me; kind of like you with Knox, your Dad and your Grandpa. There really is a lot to be said about the mental side of running and how it impacts us. Thanks for being such an inspiration and letting us tag along with you on your training. Dawnmarie. My heart absolutely breaks for you and what you have been through. I am so glad that your fiancee has beat it. I know your parents are watching you accomplish all of the amazing things that you do. I got the biggest goosebumps reading about how your write their names on the bottom of your feet. HUGE congrats on your Hot Chocolate 15k (I want to come do that)! Thinking about you. Amazing!!! Congratulations on getting your sub 3 Janae! I’ve been following you for years and it’s such a journey you have been on. Somehow you come through all the ups and downs and make it out to the other side Even stronger than before. You are an inspiration and I am so happy for you!!! Janae….did you know that Shark Tank season 10 premiered last night!?!? CONGRATULATIONS! This is such a huge deal, and I am just so thrilled for you! You crushed it! I loved reading your re-cap. You really did awesome during this training cycle. 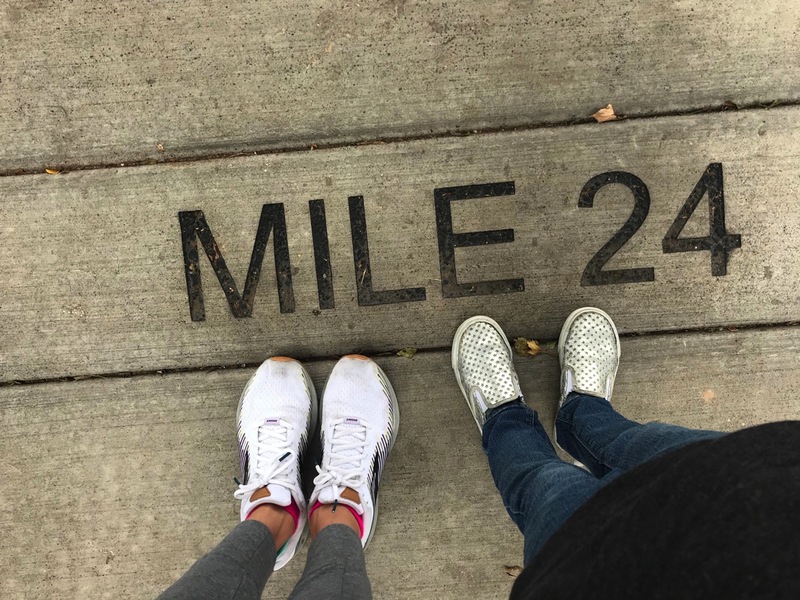 I started reading your blog shortly before you ran Boston and so I just went back and re-read your last 4 marathon re-caps. Think about how much your life changed in 2016?! I know i sure didn’t want to concentrate on much else when I first met my husband. Even with Andrew in school you really were able to concentrate on making this goal happen. I love that he forewent running the marathon so you guys put your energy into this happening for YOU (after all, you are holding down the fort majorly so he can be in school, so I am so glad you could get your me-time in too and I loved that you didn’t have to be on the treadmill too much!) Now go enjoy your candy and I look forward to what comes next for you! I have been following you for YEARS now. I was sitting by my phone, checking Instagram, all morning Saturday just waiting to hear how you did and we have never even met! I am so happy for you, you deserve it all! Congrats! Thanks for inspiring! Janae! this is so amazing! So very proud of you- I totally choked up through your recap! I lOVE LOVE LOVE your candidness and your honesty- so go rest up! Awesome job and congratulations once again! Was so so excited for you after following all these years. Your blog was the first running blog I ever followed back in 2013 and I’m so excited to see you finally smash this goal!! Be proud. Soak it in and enjoy!! I’ve been reading for years and years, and I’m not sure if I’ve ever commented before, but I’ve read this recap twice and cried both times. Congratulations x1000 on accomplishing this amazing goal. 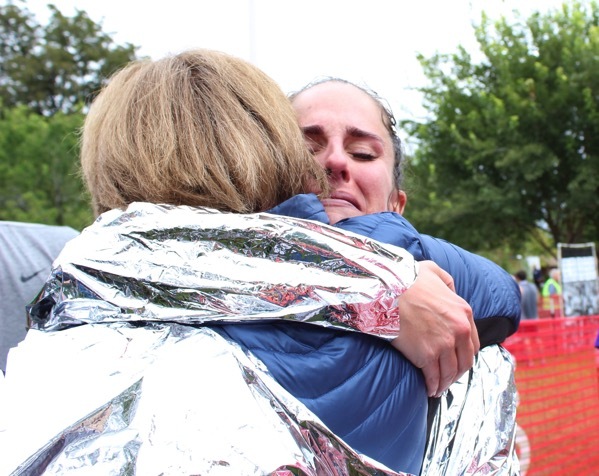 Also, that picture of you and your mom after the race is fantastic. I’m late to the game in replying, but man, I am sitting here with tears rolling down my face. SO.DARNED.HAPPY.FOR YOU. And, you worked SO SO SO dang hard for this. I love everything about this. Huge congratulations, Janae!!!!!!! Hi Janae, I am so inspired!!! WAY TO GO!! I ran a half last month and have been itching for that Sub 2– however I knew my training was not where it should have been so I decided to just run feeling strong and confident and threw all time goals out the window. I also wrote “Yes You Can” right under my watch band which helped. Loved seeing and reading your positive self-talk. I think it is so important- what a game changer. I’ve got that sub 2 on my mind for Spring ’19 :) Thanks for never giving up and being an example for all of us dreamers. Congratulations Janae!!!! I knew you would eventually get your sub-3:00!! And to think this is post-baby in the last year!! You are awesome and such an inspiration! :) Hope there is lots of celebrating!! So excited for you!!! You rocked it! And I love your honesty about the bathroom break lol!! Amazing!! Such a good post! I think I’m going to read this x10 more times before I race my half in two weeks! ahhh I’m so happy for you… I’ve read your blog for years and your a HUGE inspiration.keep doing what your doing… and I have to ask, how on earth did you have enough pockets for all your gel packs?! Tell me your secrets… and did you get your phone out or did you just use your air pods to turn on your music?!!!! I think I’ve only commented once before (to try to guess Skye’s name), but I’ve been reading for years so of course I’ve got to comment now. Congratulations!!!!!! You worked so hard for months and months to get here and YOU DID IT! I’m so proud of you and happy for you! You totally earned this. It’s inspiring. I don’t think I’ll ever be as fast as you, but you make me want to try. Hope your recovery is going well! Huge Congratulations to you! I had tears reading your blog. You are amazing! I am SO SO SO happy for you and I actually felt nervous for you during the day! You so deserved this and I’m so glad that all the hard work has paid off ! Reading this made me tear up, not ideal since I’m at work ;) But then it made me smile too! CONGRATS JANAE!!!! WOW!!!! SO SO HAPPY FOR YOU!!! Take it all in! You deserve it girl! You’ve worked SO hard! Way to go! Be proud! You’re amazing!!!!! So happy for you, Janae. I’ve been following along forever, and I’m thrilled you achieved your goal! You raced well and made smart pacing, nutrition, and strategy choices. And you’re kind of making me consider a pair of hyperions! I’ve been following your journey since pre-Brooke days and I’m so happy to see you finally meet this goal!! Good for you for all of your hard work! Brava, Janae! I love so much the difference in mindset and energy (and FAITH!) that you had carrying into this race. It’s SO inspiring! Thank you for letting us be a part of your journey there. We’ve all learned so much from you. I love this so much!!!! Congratulations!! The mental toughness is something so powerful, you rocked it!! Awesome job! Congrats. Knowing you can run that pace for 26.2 might help me keep it for 10k! Thanks so much for your recap!! You are just such an inspiration! I Ran Chicago this weekend, the number of participants and the organization of the race makes it great! My favorite candy post race-red vines. Not twizzlers, red vines. And Diet Coke after the race is a must. It took me until the next day at like 9 am to get it but when I did it was amazing! Congrats! You really are such an inspiration. So inspiring, that I’ve decided to commit and run my first marathon. I’m a long way from running shape (had my second baby the same day Skye was born) so I’m giving myself time, but I’m committed. I banged out my first run in forever this morning. Thank you for being such an inspiration! Janae, my eyes are filled with tears as I read this recap. YOU DID IT!!!!! I am so, so proud of you and so happy for you. I can’t even imagine how happy you must be to have reached the goal you’ve had for so long. You are an amazing runner (whether you ever did a sub-3:00 marathon or not) and such an inspiration to me daily. Congratulations and I hope your recovery is swift and that you continue to bask in the glow of your amazing achievement. Took me forever to get through this post cause I was trying really hard not to cry. I couldn’t be any happier for any person I’ve ever not met !!!! And man oh man does this post make me wanna put on my running shoes and get out there. I think i’ll sign up for a race today. Congrats again!!!! Thanks for sharing your life with us. And so so so happy for you and Andrew to have found each other. What an inspiring partnership. Congratulations!! I’m a long time reader and am SO happy to see you get the sub-3! I just ran the Erie marathon 8 months after having my son and I ended up running my fastest time. I think there’s definitely something to be said about being stronger post-baby! 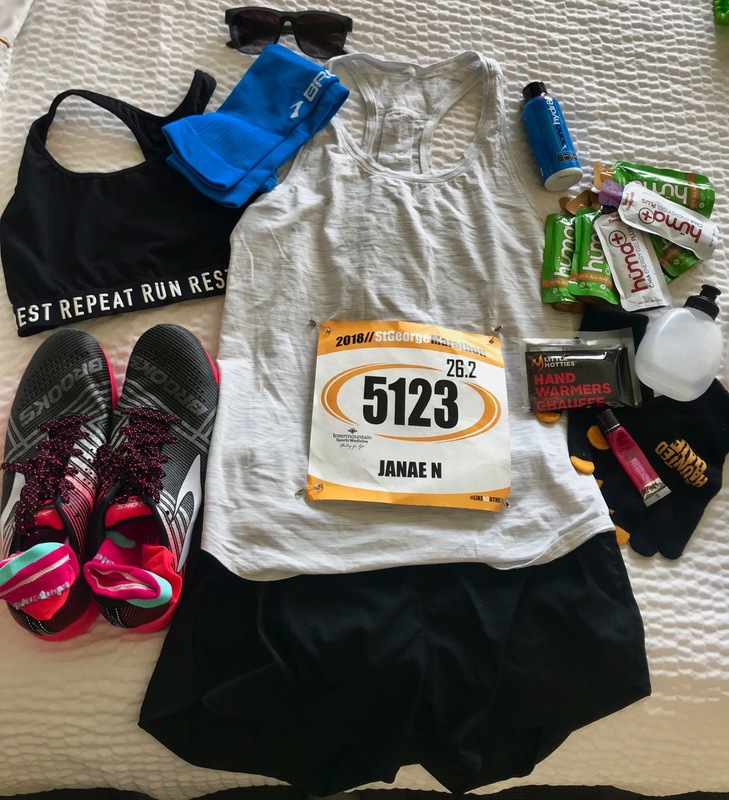 Random gear question – what tank top did you wear for the race? I really like it! I’ve been following your journey for the last 5 years and was SOO excited to see you post on Instagram when you hit the sub 3. Can you do a post sometime specifically about how you focused on improving your mental game? I feel like that’s something we can all work on, and I’d love to hear your tips and what worked for you! YES YES YES!! I totally will.. expect it in the next few weeks Kassi! THANK YOU! This made me cry! I have followed you for a long time and I always knew you could and you would….and YOU DID! So, so happy for you! Congratulations! I’m so happy for you! I teared up reading your recap. I know how much hard work you put in. YOU DID IT! I teared up at work while reading this. BEST BLOG EVER. I’m so so very happy for you! You rocked it!! I hope to run my first marathon in 2019 or early 2020. I literally cried while reading this!!! Especially when you were hugging your mom! CONGRATS!!!!!! I loved every word of this post Janae. I found the app for the St George Marathon so that I could follow your times and I was beyond excited when I saw your finish time (you probably think I am weird for tracking you). I cannot even begin to imagine the joy you must have felt. I too am trying to get the nutrition and hydration part down for my marathon (2nd full for me) coming up in January. The first time I ran the full I got dehydrated at mile 16 (felt hazy, it was very odd) even tho I had my fuel belt and had been drinking G2. Its hard for me to eat before running in the mornings so for my training runs lately I have been doing half a bottle of the strawberry banana flavored Core Power protein shake and that works well. 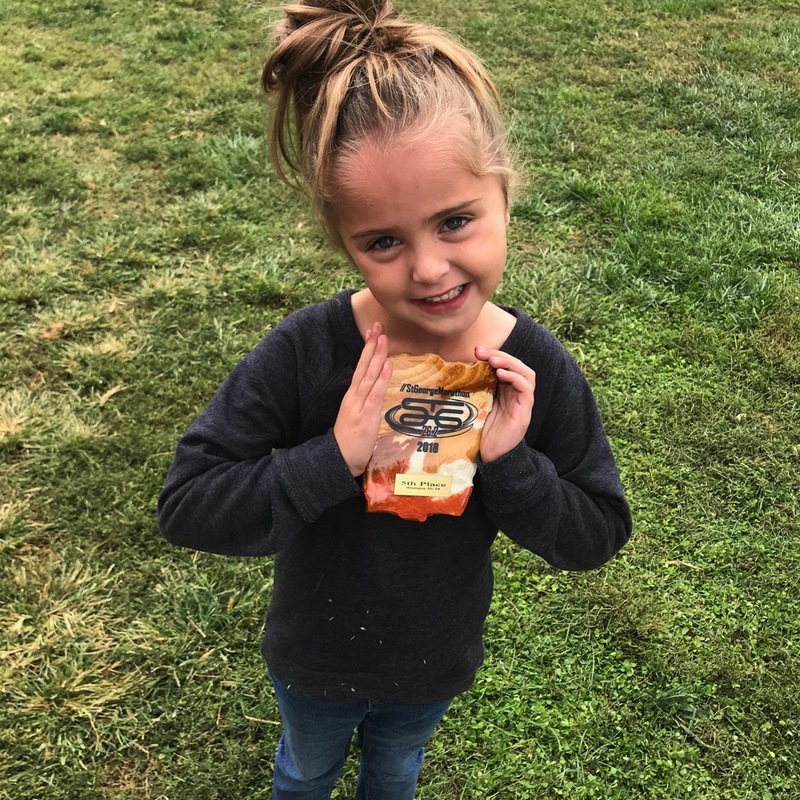 I also like those squeezy kids applesauces…gives me that boost of sugar and sits fine in my stomach. My first time I ran it in 4:33:10 and I just know I can get a better time this year. My mom always says don’t have a time just go run it. But as a runner there is always a goal time in my head. This training cycle I have been focusing on keeping my miles at a 10 min pace. If I keep that I can run it in 4:22 which is awesome. SO far so good and training is going well. Its still been hot here in Texas (Houston area) but this next week it is supposed to cool off, yippee so longer runs should begin to get easier. I know as a faithful follower of your blogs that I feel like I know you, but man I am so EXCITED and PROUD of you. This blof made me want to go run……lol. BIG HUGS to you…..You are the girl!!!! “I’m not crying, you’re crying…” Thank you for this beautiful recap. THIS is why we do what we do. I love reading about runners that achieve a goal. I have yet to reach mine due to injuries stopping in my last two cycles, but I know I’ll get there one day. Well deserved sub 3 – earned, never given. Congratulations on a fantastic race and on accomplishing your goal!! I enjoy reading your blog so much, thank you for all of your inspiring posts! Congrats again! CONGRATULATIONS! What an incredible accomplishment. I have tears of happiness for you. We all knew how badly you worked for this and wanted it – and I am thrilled you accomplished your goal! When I saw the splits, my jaw literally dropped. THAT’S what it takes to get a sub-3? Umm… SUPERHERO right here. I loved reading every. single. word. of your race recap and felt like I was right there with you! I am beyond excited for you for reaching your sub-3 goal! What an amazing accomplishment and I loved how you made a point of thanking everyone who helped you get to your goal (I may have teared up when I saw the picture of you and your mom hugging). You are incredible. I love reading your blog and following your life journey. You inspire so many people in so many ways. You are a great mom, writer, photographer, wife, daughter, athlete and motivator and more. Your positive attitude, great training regime and goal oriented self got you this amazing result. I want to be like you!!! Way to go!! So glad you achieve all you set out to do. best you go out and run that sub 3 again! That said it looks like you have a great race… not many 3 hour runners run negative splits for a first sub 3. If I’m leading a sub 3 bus we look at 88-89 for the first half, so Kudos to you for coming back strong. I loved reading every word of this. And I teared up many times, starting with the pic of you and your Mom hugging. So happy for you and meeting your goal. Rest up girl, you are amazing. Congratulations Janae. You’re determination and resilience are inspiring. Thanks for sharing your journey with us. Oh man, tears! I’m so happy for you. You’ve worked so hard for this. Thanks for sharing your journey (as a long time follower it makes me so happy to see you reach this goal! I’ve seen the ups and downs!). Way to keep at it! This brought tears to my eyes!! I am so happy for you, and I loved reading your recap. Enjoy this time of rest and the running high for as long as possible. You deserve it. I’m late to the game but WAY TO FREAKING GO! You looked so strong and you definitely left it all out there. That is amazing and I definitely am so so proud of you! You killed it. You just needed to have Skye to get that sub-3 ;-). I raced Chicago on Sunday and I got my goal of 4:15! It felt amazing and I even stopped to pee lol. It was rainy and cold too so I was drenched but I felt amazing. I never hit the wall and my only real discomfort was a blister I got from my shoe rubbing from the wetness. It’s only my second marathon but it felt awesome to be so strong throughout the race. Long time reader, first time commenter :) Congrats!!! So amazing. I have a 5 month old at home and am struggling to get back into my running “groove” and build time for running which I know fills my cup so much. Your success is so inspiring as you are a mom doing just that! With the help of your village, you are continuing to chase your dreams. Feeling inspired to make it happen for me! Thanks so much for sharing. Congratulations Janae!!!! I just started crying reading this during my lunch break at work. The biggest thing I have ever overcome is infertility. And reading your words…”As you know, there have been many failures, lessons, injuries and growing since then so the sub 3 definitely took more time to get than I was planning on. reminds me SO much of how I feel now that my sweet daughter is here in our arms. Love reading your race recaps and SO happy for you that you got your sub-3! This post made me teary-eyed. SO HAPPY for you! Have all the Lindt chocolates and root beer for me. I’m currently trying to clean up my diet. I know I am late to the party but holy cow, Janae! You are a star! You worked your backside off for this and I am overjoyed that you got what you deserved. It brings tears to my eyes and a smile to my face. Big congrats from Belgium. This is so inspiring! Thank you and Congratulations. I had my second baby Friday so I will read this for motivation as I gain back fitness! Thank you for this amazing race recap. I’ve never read such an amazing recap! Love it so much. I’m laying on this couch, sick, one week before my marathon and found this. Thank you. I’m literally crying as I read this. It is SO good! Many blessings. These words you have written are going to help me so much. Thank you! Get better ASAP!!! I can’t wait for you to have an amazing marathon and please let me know how it goes! Thank you for your comment! You’ve got this!!! I know I’m late in saying Congratulations on the blog, but, CONGRATULATIONS!! This post made me cry, I am so happy for you. You’re are so inspiring and you have a awesome family. Congratulations Janae!! I literally cried reading your post, this is a great achievement and I felt like I was running with you by the way you described it !! I started to run and your posts are a big motivations for me, I hope one day I run a marathon as you have. I cried the whole time reading this recap. Congratulations you are amazing! Just have to tell you on your race day I was thinking about you and your race and I checked Instagram and saw that you had gotten your sub 3! I was seriously SOOOO excited for you…and you don’t even know me, but I have been reading your blog for about 4 years now. You were the one that inspired me to run a marathon on my treadmill! :) I am so happy for you! You deserve such an amazing race! 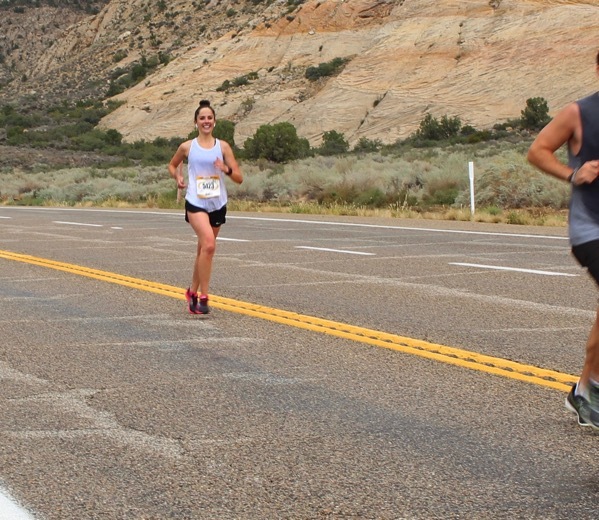 So happy you got it on the St. George course. That one is one of my favorites too! Just wanted to tell you congrats and thanks for inspiring me!!! P.S. I have also been listening to your podcast with the rambling runner and have been enjoying that! this post made me tear up so many times! just like everyone else’s wishes…huge congratulations to you Janae! you deserve this more than anyone! so so proud and loved being along as a reader through this journey (ok and alllll the other ones, too.) you rock girl!! !